Probably the least standardised of all stringed instruments. Size, string length and number of strings all vary according to the music you want to play. 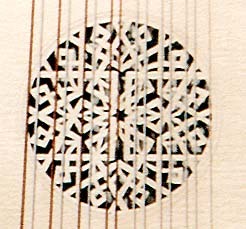 This example, sold through the Early Music Shop in Bradford, is an eight-course instrument based on the Giovanni Hieber lute in the collection of the Brussels Conservatoire. English walnut was used for the head, neck and body, European spruce for the front, Brazilian rosewood for the fingerboard and African mgurere for the pegs. Because lutes vary so much, Antony normally only makes them to special order.